Malaysia will send its police officers to Macao Thursday to collect DNA samples of the son of Kim Jong-nam, North Korean leader Kim Jong-un's half brother who was assassinated in Kuala Lumpur last week, media reports said. Chinese-language newspapers in Malaysia, China Press and Sin Chew Daily reported that the Malaysian police will send three officers to Macao on Thursday morning to gather DNA samples from 22-year-old Kim Han-sol. The Malaysian officers will collaborate with Interpol in Macao and their trip will reportedly last for two days. Kim Jong-nam, the eldest son of late North Korean leader Kim Jong-il and half brother of the incumbent leader, was assassinated with what a Malaysian investigation said was poison by North Korean agents at Kuala Lumpur International Airport last Monday. The Malaysian police called on Kim's family to come to the country and undergo a DNA test to retrieve the body which is now kept in a hospital in Kuala Lumpur, but no one has come forward so far, possibly due to assassination fears. A source said the Malaysian police took note of the Kim family's sensitive status and the difficult situation they are currently in when it made the decision to dispatch the officers to Macao. Han-sol and Kim's other family members are reportedly in Macao and Beijing under the protection of the Chinese government. After collecting DNA samples, the Malaysian police will immediately try to match them with that of Kim Jong-nam in order to verify his identity and eventually hand over the body to his family. North Korea's state-run press, Korean Central News Agency, denied in a report earlier in the day the body belongs to Kim Jong-nam and accused Seoul of cooking up the murder case against the regime. 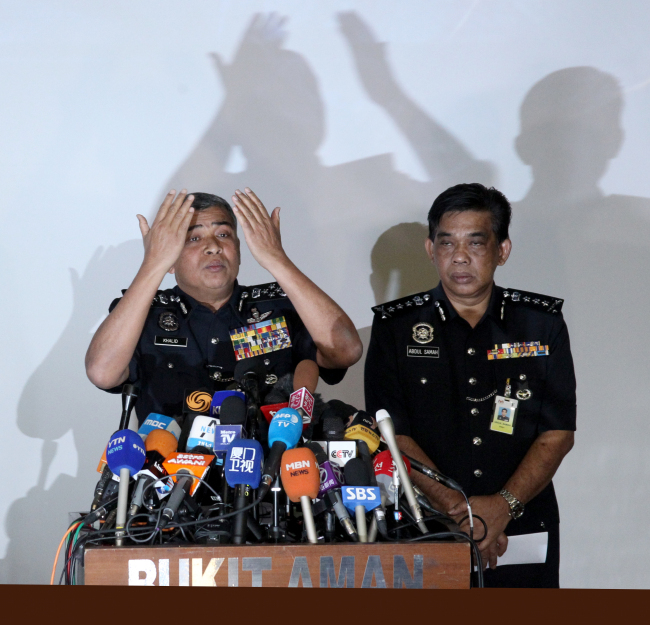 Malaysia's police chief later said, however, that the country has not sent a DNA sampling team anywhere, denying the dispatch plan, according to other Malaysian news reports.